Starting off as a budget TV maker in the 1970s, Samsung now holds the distinction of being the World's largest, and one its most innovative TV makers — with offerings across all price ranges and screen sizes. When it comes to TV innovation, Samsung definitely doesn't take a back seat to anyone. In addition to the video and streaming features you find on TVs these days, Samsung has added another bonus: Smart home control with SmartThings. Ordinarily, home control is something that requires a separate physical and operating infrastructure (in many cases it can be expensive), but Samsung adds its twist to the fast-growing market of simpler and affordable alternatives such as Alexa and Google Home-based systems by way of its SmartThings platform. Samsung's alternative can take advantage of a TV and use it as part of the home control environment. When the SmartThings App is activated on both a smartphone (iOS or Android) and select Samsung Smart TVs, home control features can be accessed via the TV's own operating system, in addition to the smartphone. Your TV, smartphone, and SmartThings devices all need to be connected to the same WiFi network. To see if your TV is compatible with SmartThings, check the Supported Devices section of the SmartThings Smartphone app. 2016/17 (K, M) model-year Samsung Smart TVs can be controlled by the SmartThings Smartphone App, but only 2018 (N), 2019, and model years going forward have access to the TV version of the SmartThings App that can be used to control external SmartThings devices. However, if you do have a pre-2018 model, definitely check its degree of compatibility with SmartThings as firmware updates may change the above status. From the Smartphone App Dashboard, tap Supported Devices. Tap TV and look for your model. On your Samsung Smart TV Remote, select Apps. Select the Search in the Apps Menu. Type SmartThings to call up the TV version of the SmartThings App. Once the app is installed, you can open it to view, monitor and control your SmartThings hub and devices using your TV. 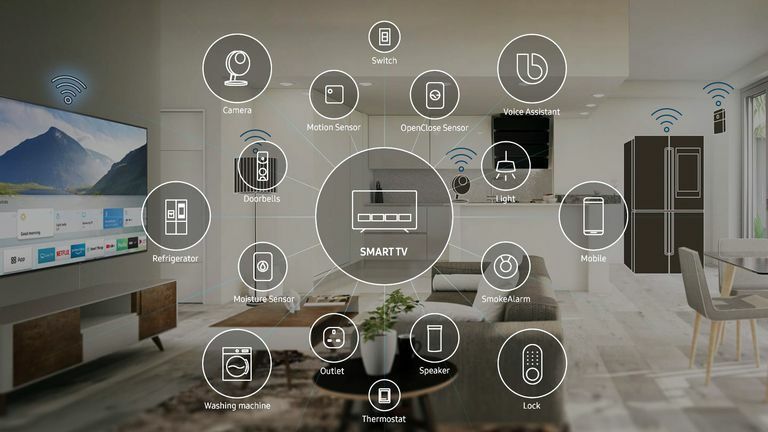 To make this work, you will need a SmartThings Hub and SmartThings-enabled devices, such as lights, surveillance cameras, locks, thermostats, multi-room audio components, and other compatible appliances SmartThings supports. You need to create or sign in to your Samsung Account and Set Up your SmartThings Hub (also, additional smartThings devices may also require separate setup) to use the SmartThing control features. Once signed in, any devices registered to your account through SmartThings should automatically show up. For the home theater fan, SmartThings can control several elements of your viewing environment (turn on the TV and set up commands that control other audio and video devices, dim the lights and/or shut the blinds, and maybe even turn on that popcorn popper). SmartThings expands the role of your TV beyond entertainment and as a tool to enhance your lifestyle via control of many household devices. Control selected functions your TV via the SmartThings App (power off, channel selection, volume/mute) on your TV or mobile phone. Control and check the status of other SmartThings devices via your TV without having to use your Smartphone. With a Smartphone or compatible TV voice remote, you can use Bixby to control your SmartThings or "Works With SmartThings" devices. You may be able to also use Google Assistant or Amazon Alexa to control your Samsung Smart TV and many SmartThings devices.